Puerto Rico is on the brink of default -- and a massive population drain. Its economy has been spiraling for years now, and Puerto Ricans of all social classes have had it. They are moving to the mainland United States in rising numbers in search of jobs. "We're in unprecedented territory because this is, in recent memory, the biggest out-migration that Puerto Rico has experienced," says Mark Lopez, director of Hispanic research at Pew. 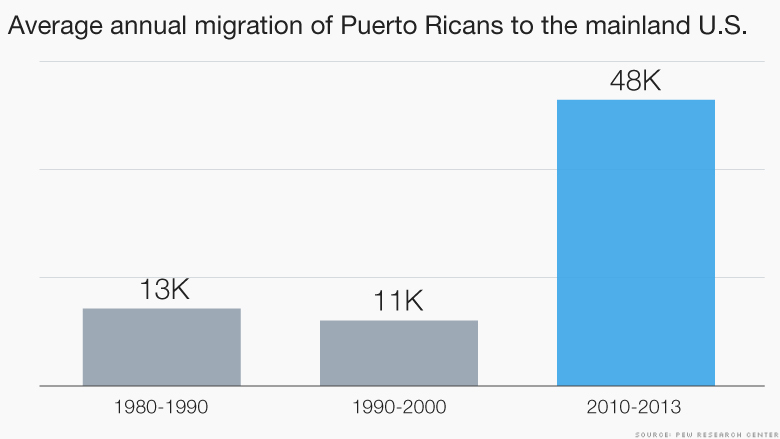 It's gotten to the point where the migration is beginning to rival the record numbers of Puerto Ricans who arrived in New York in the 1950s -- the "West Side Story" era. A debt debacle: In total, the Puerto Rican government is $73 billion in debt, and there's a solid chance it could default this summer. A big payment for its energy provider is looming in July. The problem looks like this: Puerto Rico has similar debt to New York -- a very large state economy -- but it only has the population of Connecticut. Every time someone leaves Puerto Rico, it only exacerbates the situation. It shrinks the island's tax base, which the government needs to pay for itself and its debts. In recent years, the government just issued even more debt to pay off its current debt. Puerto Rico's problems result from years of government overspending, high energy costs and dependence on debt, says Ted Hampton, an analyst at Moody's who covers Puerto Rican bonds. "It's a self-perpetuating, vicious circle," says Hampton. Along with a shrinking population, "the economy of Puerto Rico at the same time has also greatly underperformed." 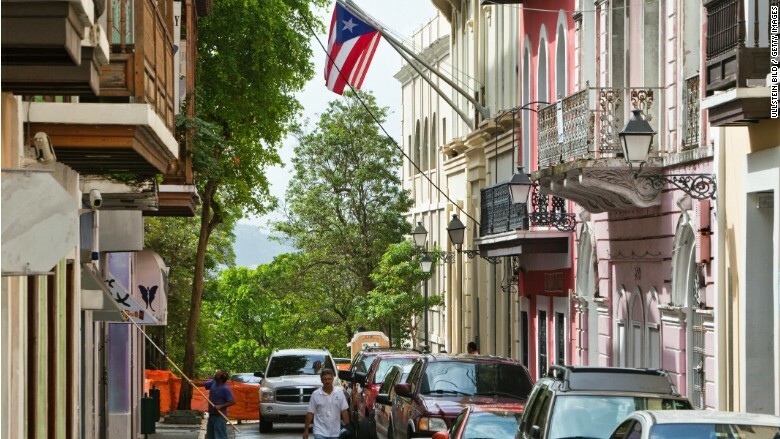 Moody's downgraded most of Puerto Rico's debt even further into junk status in May. Related: Everybody wants to go to Cuba, what does that mean for the rest of the Caribbean? Puerto Ricans are leaving: That news wasn't received well by many Puerto Ricans, especially college graduates. They're getting their degree and leaving, says Maritza Stanchich, a professor at the University of Puerto Rico and a columnist. "It's a marked shift in the past 10 years," says Stanchich. One of Stanchich's former students and his wife plan to leave for Austin, Texas, in July. He's never lived outside Puerto Rico and had no plans to move up until a year ago. When Moody's first downgraded Puerto Rico's bonds to junk status last year, he made the decision to leave. "I don't think we've hit bottom yet and that scares me," says the 25-year-old graduate, who requested anonymity because he hasn't quit his job in Puerto Rico yet. "There comes a point where you say 'I've had enough. I'm a good person, I'm a good citizen, I pay my taxes.'" He isn't alone. Consider this: between 1980 and 2000, the average annual migration of Puerto Ricans to the mainland United States was 12,000 people. From 2010 to 2013 -- when the economy started tanking -- that figure jumped to 48,000 people per year. Energy problems: More people might try to leave after July 1st. That's when the government-run electricity provider, PREPA, has to make a $400 million debt payment it almost certainly can't pay. Moody's has rated PREPA's bonds in the lowest category possible. PREPA has about $9 billion in total debt. By comparison, when Detroit went into bankruptcy, it shed $7 billion. By law, Puerto Rico isn't allowed to declare Chapter 9 bankruptcy the way that Detroit did. PREPA's problems are an oil story. The company still imports and burns crude oil to power its electric plants. While others in the Caribbean have turned to natural gas and renewable energy, PREPA continues its "inefficient" energy spending, according to Moody's analysts. The looming default may foreshadow a difficult dilemma for the government. It must start making decision between what's best for its people and what's best for its creditors. "Those two obligations are coming into conflict here," says Hampton, the Moody's analyst. "Puerto Rico's economy has languished and its citizens have been leaving the island to come to the mainland." Editor's note: A previous version of this story contained an incorrect statement about the size of Florida's Puerto Rican population. It has been removed.